Many months ago I accepted an offer to review a book written by one of America's finest, a veteran, a Vietnam veteran. I didn't think it would take me an eternity to finish the book, not because I didn't like the book... but because at the end of the night I can often barely keep my eyes open to nurse the baby, let alone read a chapter in a book. But I did it. And here I am to tell you all about Curse of the Coloring Book, by Howard L. Hubbard. "When Herald Lloyd, an attorney and family man, learns he's been cursed with a catastrophic legal-malpractice lawsuit, his recurring Vietnam War flashbacks flood his consciousness, and he medicates his post-traumatic stress with alcohol. He was reckless to quit college to join the Army. 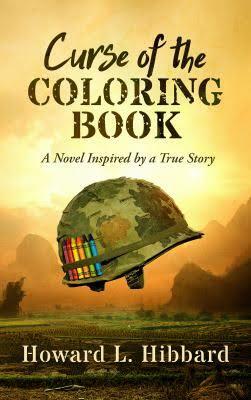 Mocking the war, he bought a GI Joe Coloring Book and half-gallon of whiskey, for a drunken send-off with his fraternity brothers. Vietnam hurls Herald into becoming a decorated combat platoon leader, commanding stressed oddballs and misfits like Dogman, who walks point and only barks to communicate. Now he must fight again, this time to save his client, law practice, and family. Was the coloring book cursed?" Inspired by a true story, this novel will bring you in time and time again. Just as you think you've heard it all when it comes to the Vietnam War, the stories shared in this book will take you right back to a different time and a war most young Americans could never imagine. There is love, infatuation, family ties, war stories, gore and victories that take you through every lawyers worst nightmare, a malpractice suit. Of course, I will not tell you how the book ends. But you'll be hanging on to every word hoping somehow, someway one final victory is to be had and the coloring book is not actually cursing Herald's life. I would 100% recommend this book to anyone who enjoys war stories mixed with a little bit of civilian life. Most everyone will find something they are hooked on in this book and you absolutely can't go wrong with that. I received this book for free, in return for an honest review.